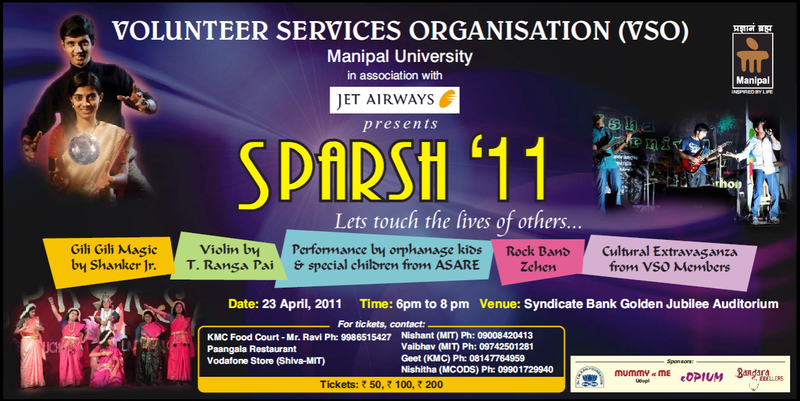 The Voluntary Service Organization (VSO) of Manipal University (MU) will organize a cultural programme, Sparsh – let’s touch the lives of others at the Syndicate Bank Golden Jubilee Hall on Saturday 23rd April. Various programmes including a Magic show by Shanker Junior, A Violin recital by T. Ranga Pai, a performance by the Rock Band Zehen and a performance by the orphanage students of Asare will be among the highlights of the event. VSO is an organization which reaches out to the needy of the region. It was started four years ago and has been working for the betterment of the place and people.